Our long journey to Phnom Penh from Vietnam was surprisingly smooth! We did a 3 hour boat journey to the border visiting a fish farm and Cham minority village on the way. Customs and the border crossing were a breeze, then we took another 3 hour boat ride on the Cambodian side to the mainland and a short bus journey into Phnom Penh. We enjoyed our time in Phnom Penh, learning a lot about Cambodia's tragic past. We visited the Khmer Rouge "S21" prison (Tuol Sleng Genocide Museum). 20,000 people were tortured here and only 7 lived to tell the tale. The bloodstains are still visible. We also visited the Killing Fields at Choeung Ek. Much of the land remains unexcavated and the clothing of victims can be seen poking from their shallow graves. It was a really moving day and unbelievable that genocide still goes on without intervention in the world today. Our second day in Phnom Penh was not so sobering! We visited the Royal Palace and Silver Pagoda which are beautiful buildings in a lovely setting. The last few days we have spent in Siem Reap (probably more Westerners here than anywhere else we have been so far!) 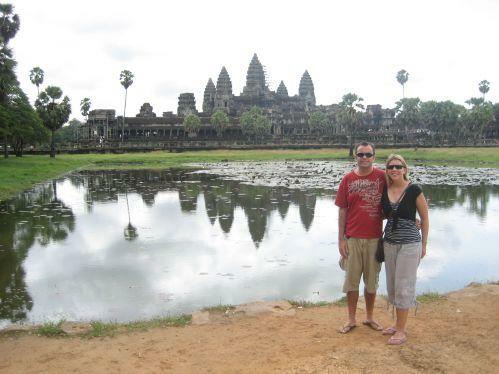 visiting Angkor Wat and many other ancient temples by tuk tuk. We also visited the excellent Land Mine Museum run by a former Khmer Rouge child soldier. He has led an interesting life and has de-mined many more UXOs than he laid as a child. Aki Ra and his wife look after children who have been injured by landmines or are otherwise disadvantaged. The work Aki Ra and the NGO funding the museum do is inspiring. Our time in Cambodia has flown by and we fly to Laos tomorrow!